If Bilbo Baggins and Samwise Gamgee had a car accident, who would they call? This preciousssssss Pun Shop Name was retrieved from the Fortress of The Lord of Mordor (Brookvale NSW) by the Royal Elf Galadriel (Honae MacNeill). OK, so I’m breaking the rules here a bit. Though technically not a Pun ‘Shop’ Name, I figure this guy works out of his car, so it’s kind of a shop. Whatever. 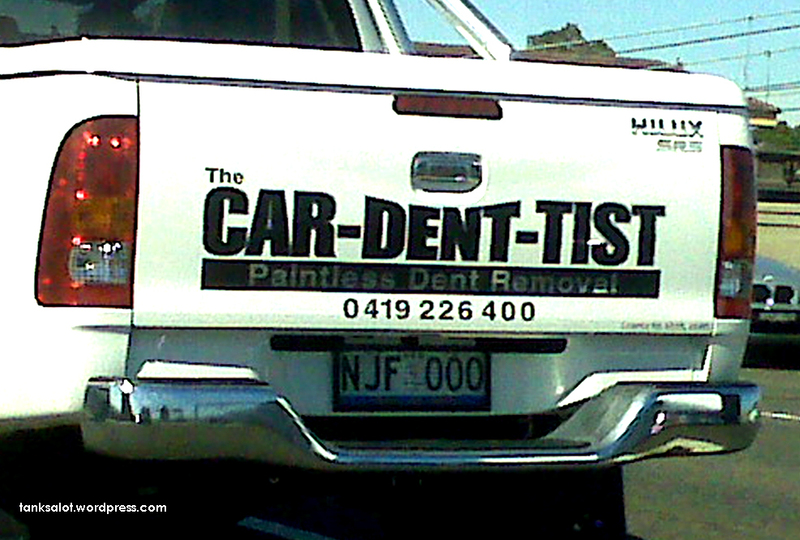 The Car Dent-Tist.. brilliant. Spotted by first-time punster Renata Barbosa on the Sydney Harbour Bridge.